Complex structures and high production costs associated with monoclonal antibodies (mAbs) have limited their achievable clinical applications. For this reason, scientists focusing on antibody drug discovery have shifted their interests toward recombinant antibody fragments. 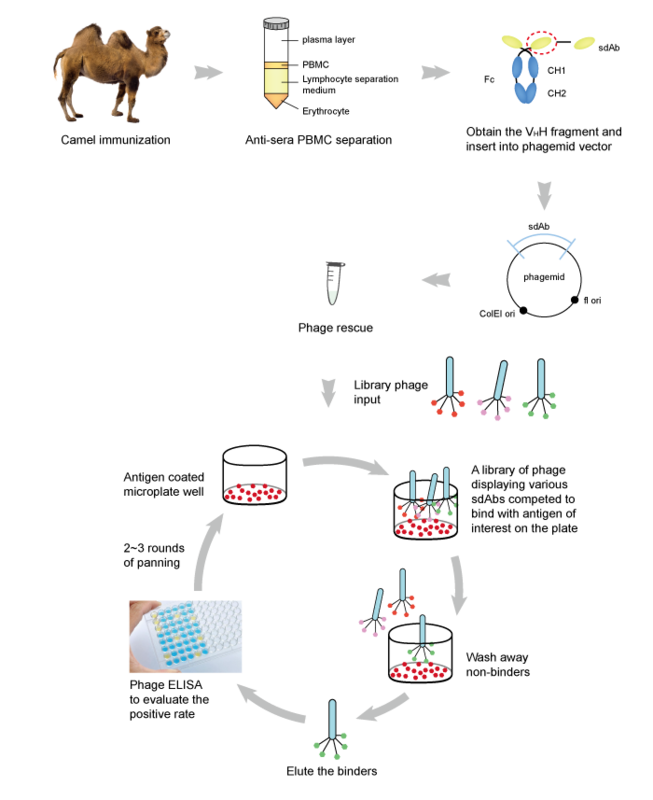 Recombinant antibodies, such as single domain antibodies (sdAb), are a new generation of engineered antibody fragment that consisted of a single monomeric variable antibody domain. sdAb is derived from camelid heavy chain antibodies which lack the light chain and CH domain of the heavy chain in the conventional Fab region. Therefore sdAb is smaller, more soluble and has higher stabilities than conventional antibody. sdAb also features higher permeability, lower immunogenicity and both simple and cost-effective production procedures. These advantages have made it possible for sdAb to have a broader range of applications within the biotechnology, pharmaceutical and immuno-therapeutic industries. Based on Synbio Technologies’ extensive expertise in sdAb and advanced sdAb discovery technology, we can provide our customers with a comprehensive one stop solution from antigen production to specific recombinant sdAb expression.